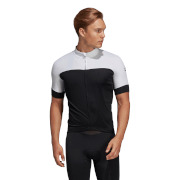 The Mortirolo full-zip jersey not only looks great with its galatic design, but gives you all of the technical features to feel comfortable and fresh for hours! From the second you put on the jersey, you'll notice how the technical fabric feels soft to the touch. Its super lightweight breathable material moves with your body while pulling moisture to the outer layer for quick evaporation. The fabric also eliminates odors caused by microbes and offers UPF 50+ protection from the sun’s harmful UV rays. Made by Nalini in Castel d'Ario, Italy. Thanks to this treatment, the moisture generated through normal transpiration is quickly conveyed away, instead of being absorbed by the garment. The optimized synthetic fibre carries out constant evaporation and more effective heat exchange. The result is a sensation of freshness on the skin. Such breathbale treatment resists to gentle washing, by keeping itself unchanged over time. 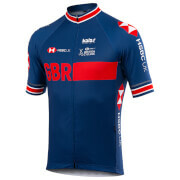 Without any doubt the very best by far summer jersey that Nalini has produced till now. The color, the design, the incredible quality of the material justify the very high price. Only for the experienced cyclists who demand the best of all, with absolutely zero compromises. I would rate it even more than 5 stars if i could.